This card is all about celebration, friendships, and communication. It indicates social gatherings, parties, and honoring the blessings of social interaction. Inverted, it could be signifying my recent retreat into self. I’ll have more to say at the bottom of this post. There are three cards in the tarot that focus on the group – each from a different point of view. For the Hierophant, it’s the formal approach. For the Three of Pentacles it’s teamwork, and for the Three of Cups, it’s emotions. What does it feel like to join with others? What is friendship and community? These are the questions answered by the Three of Cups. In readings, the Three of Cups can signify a friend or the feelings associated with friendship. This card can represent community – the network of support created when we interact with others. It can be any group in which the members feel a bond. When you see the Three of Cups, examine your attachments to the groups in your life from an emotional point of view. Consider reaching out to give or receive help. This card stands for all forms of support, including formal aid such as counseling and other social services. The women on the Three of Cups also express joy and high spirits. Such feelings are not limited to groups, but can be especially strong there. Celebrations spontaneously arise when people feel connected, loved and secure. The Three of Cups can stand for a mood or experience that makes you feel like dancing and singing. Three maidens with three overflowing cups celebrate. The creation here, springing from the relationship in the two of cups, is happiness, togetherness. Two cups pour into a third and it overflows with love and joy, enough for all. This is a card of parties, weddings, anniversaries, baby showers, birthdays. Any time that families get together and reunite in celebration of something new. Joining a group of like-minded individuals; emotional celebrations of all kinds; positive group mind; comfort; a happy outcome of an emotional situation; good luck; emotional fulfillment of something long awaited. As a temporary vibration: Abundance, rejoicing, healing. Congratulations are in order. This is a period of rejoicing because the results of your past endeavors are now evident. You have concluded matters successfully and realized your goals. The rewards are yours. If your pursuits have been professional, you now realize financial increases, promotion, and business expansion. If health has been an issue, healing takes place. Family difficulties smooth out, and you are overwhelmed by success, peace, and extra benefits that you are now enjoying. This is a restful vibration, so loosen up and enjoy it. Follow your routine or take a vacation, but maintain the status quo. Pushing new ventures and pursuing new avenues is not a part of this cycle. Sit back and relax. Be careful that your celebration does not degenerate into overindulgence. Too much of the good life can bring on physical discomforts. If you select your partners indiscriminately, relationships can suffer. So eat, drink and be merry in moderation. You have earned it. Tarot Symbolism: This key depicts the celbration of bounty and good fortune. Three maidens jubilantly toast the happy outcome of their work – the abundant harvest pictured around them. Notes: On instinct, I think of Sorscha and Indigo, as they’ve been my two strongest allys in progressing towards my goals. They are the two who call and check on me if I’ve “gone dark”, gotten ill, or otherwise seem distressed. 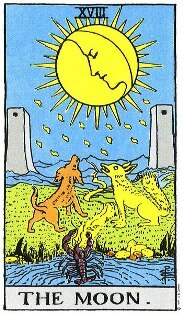 On the same token, however, I must remember that while this card has a beautiful and celebratory definition, it also appeared today REVERSED – which means either the energy is just surfacing, has already climaxed and is on its way out, OR, that the opposite of this card’s definition is manifesting. Eights are symbolic of the Yin/Yang in life… the ability to find balance between light and dark, good and bad, joy and pain. They represent the ability to look at a situation that may appear negative, and extract what positive values there are to be found within it. If things are good all the time, we lose appreciation for their value. If things are bad all the time, we lose hope and inspiration. By finding our footing in the center, we find balance wherein we appreciate the value of what we do have, because we know what it is to not have. Wands are represented by the element of fire – they are the “spark” of change and trasformation, the first step in mainfestation. If this card were upright, I’d know that the energies I put out there to get new projects/relationships off the ground were now starting to come back to me… in abundance. But, because it is inverted, I know that it’s time to let go of certain elements, retain only the things I know are going to prove fruitful for me, and focus my intent and direct my energy consciously and wisely toward those things. A pruning of the soul, if you will. This card inverted could signify that I’ve spread myself too thin, that I had too many things going on at once, that my energies have been scattered. Time to reduce and get back to the basics. In the film The Ten Commandments, Moses touches his staff to water to set a plague in motion. His staff is the agent of power that initiates events. Moses’ staff reminds me of the wands on this card. They are a symbol of the onset of action and its effects. Before acting, we think, imagine, speculate, talk and dream. This is the realm of air – the sky. Then, finally, we decide to make our move. We bring our ideas down to earth and put them into action.In readings, the Eight of Wands is often a sign that now is the time to declare yourself. All the elements are ready and will work for you as long as you don’t hesitate. The iron is hot – so strike! If events are in motion, they will proceed rapidly. 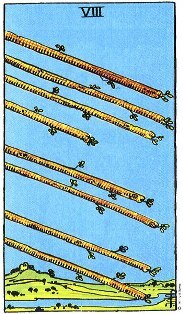 You may feel caught in a whirlwind, but soon the dust will settle, and you see how your plans have fared.The Eight of Wands also stands for the arrival of news or information. You may see or hear something important. The news could show up in a disguised form, so stay alert. Pay attention to everything that comes your way for a while. Going with the Rider-Waite deck, we’ll relate the Eights to Strength. Eights are about moving, taking action, as Strength is a card of courage and transformation. It’s very easy to let things stay as they are inside yourself or without (though, as the Eights warn, it’s easy but damaging). It is much harder to gather up the willpower and mental strength to make a real change. A scary change. Like the Strength card, it is scary to approach that lion, but you can alter the relationship you have with it. Eight wands cut across the sky. The power and energy of eight combined with the energy of wands makes this a card of movement and expansion. There is no fear in the Querent at all! This is the card of a person who, on seeing that lion, says, “Allow me!”, rolls up their sleeves, shoves everyone out of the way, strides up and raps the beast on the nose. “Don’t you try to push me around!” they snap. A lot of things are going to be happening fast, and the Querent is going to revel in and handle all of them. This will likely include trips – and the Querent will want to drive or fly him/herself, likely. Fast. No need to slow down or be impatient, with this card, you can really move, change, do. This card also signifies endings. Sooner or later all activities run their course. The eight wands on this card not only symbolize putting events into motion, but also bringing them to a close. They appear to be ending their flight by coming down to earth. If you see the Eight of Wands in a reading, it may be time to conclude whatever you have been doing. Celebrate the past, but prepare to move on to something new. Messages; communications; Internet surfing and business; e-mails; phone calls; faxes; long-distance travel; hasty action; letters of love and passion; action and excitement; forward pursuit of one’s goals; much can be accomplished if you think before you act. Tarot Symbolism: Eight of Wands. Eight live forces move swiftly through the air, unobstructed over open country. All follow the same direction, pointing east toward the light, and aim toward the earth and water. The lower wand is actually touching earth and water to show the blending of the three parts of mind and the four elements. It depicts the integration of the above with the below. The significance of this key is orderly growth, with much cosmic help. As a temporary vibration: Preparedness, strength, inheritance, recognition, business. This is a period when almost anything can happen; you should be prepared for wahtever comes. The demand is toward more responsibility and discipline; you will need to use your stored energy source. You may be promoted and therefore have to withstand more pressure and more work. The honors bestowed now reflect past efforts. This is a money vibration, and job advancement usually means an increase in salary. However, inheritances also come under 8, so this is another source of money. The pressures of this period will affect your health only if you work and worry too much. Allow sufficient time for rest, follow careful eating habits and relegate the demands of the material world to their proper place. Your health can improve through the exciting demands placed upon you; you will never feel more alive. So use the tremendous vitality this period has to offer. Get the job done, whatever the job happens to be. Autumn Sunrise is a name that came to me several years ago when I was working on a spiritual journey writing workshop. One of the assignments in the course was to give our Divine Spirit, our True Selves, a name other than the one we’d been given at birth. It was a task of self discovery, of getting to know oneself on a deeper and very personal level. Being that Autumn is my favorite season because of its bursting colors and crisp scents, representing a peaceful time of change, it felt “right”. Sunrise is my favorite time of day, even though I don’t see it often. It represents new beginnings, the coming of the Sun, fresh energy, warmth, and bright light. I put the two together and came up with the spiritual identity of Autumn Sunrise. The Blog is called The Road Home: Divine Truths of Autumn Sunrise because unlike blogs of my past wherein I focused on metaphysical subjects or promoted my professional writing self, this blog is being born out of an earnest desire to reconnect with myself, to know myself on deeper levels, to discover my own divine truths. I feel I’ve been a bit lost, and these writings are my personal map… the markers that guide me on the road home. In daily life, and professionally, I’m known as Wendi Friend. I’m including my real name in addition to my user name because this blog, unlike others I’ve hosted, is designed to encompass all of the pieces and parts of me… the mother, daughter, sister, employee, writer, mystic, and whatever else pops up. I’m bringing together all the aspects of Self. When I was younger, I hated the name Wendi. It didn’t feel like it fit. It didn’t feel “pretty”. As I aged, the name grew on me, especially as I began looking up the origin, meanings, and history of names, as well as the meaning of numbers as they pertain to names. So what’s in a name? The first definition that hit home with me was that the name Wendi, of Slavic origin, translates to “Wanderer“. It seems fitting as I’ve not yet rooted myself in any place, person, or thing. I skip from project to project, flutter from one residence to another, bounce between jobs, and generally “wander” through the school of life. This second definition listed below is relevent due to its connection with Peter Pan. Of the many “pet-names” I’ve been given, Wendi Lady is among the most common. The fact that I have on ongoing love affair with Tinker Bell (as well as all blessed entities from the Otherworld), tickles people pink when they connect my name to the characters of Peter Pan. In fact, those I currently work with have taken to calling me Tink. Furthermore, my current last name, garnered through a marriage that ended in divorce, is Friend. Considering that the name Wendi was a spin-off of the word friend (as mentioned below) makes my current name even more interesting. This second definition, however, also connects my name to Gwendolyn, which is interesting due to the fact that my middle name is Lynn. Some beliefs suggest that the numbers of our name are significant in our creation, that a number can indicate a certain personality or life path. Unfamiliar with names and numbers? Here’s a chart that’ll get you started. My first name equates to the number 28. Reduce that to a single digit by adding the two numbers together. Add the 2 and the 8 together for the number 10. 1 and 0 equal 1, so the number assigned to my first name is 1. My middle name adds up to 20, which we again reduce to a single number, 2. My last name at birth also adds up to 20, which is then reduced to 2. What does that mean? According to the chart provided, 5 is adventurous, mercurial, and sensual. There are 14 letters in your name. There are 3 vowels and 11 consonants in your name. English Female Literary; a created name that first appeared in James Banie’s Peter Pan. You dream of being creative, intellectual, and universal; the selfless humanitarian. You understand the needy and what to help them. You would love to be a person people count on for support and advice. There are 13 letters in your name. There are 6 vowels and 7 consonants in your name. English Female Born in the fall; The fall season. Interestingly enough, the Inner Dream reamins the same… and how true it is!